This LABC-iBed Tablet Stand is a must have for anyone that owns an Ipad or Kindle. It’s state of the art, sleek design is meant to look stylish in any setting. Use it in your bedroom, kitchen, living room, or outside to get the optimum view of your tablet device. It comes in two different colors, silver and black. Reducing the strain on your neck and back is important when you use your device, and this stand greatly helps with that. You can adjust the height too so even your kids will be able to use the stand as well, which is nice if you are worried about them dropping it on the floor. 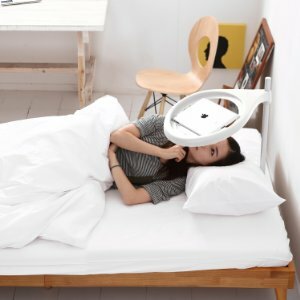 Using it in bed is a plus since you can place the stand under your pillow so that it hangs over your head for easy reading. Ever fall asleep while holding your device, and drop it? This will prevent that since it does all the holding for you. It’s really a clever invention. The iBed will fit various versions of the Kindle or Ipad, even the smaller versions will fit on this adjustable stand. This is the perfect gift for a college student going off to their first year of school. They won’t want to be without their device, and this is a way to keep it safer while using it. You don’t want them to come home year after year with a broken screen, so this is a good going away gift for students. You know sometimes when you buy accessory products you don’t end up using them? This won’t happen with the iBed Tablet Stand. It’s very useful!